Core scripture: “By this all people will know that you are my disciples, if you have love for one another” (John 13: 35). Message: Let’s play a game. I can already hear you saying, “Oh, I love games!” The game is called … GUESS THAT JOB! I will soon describe a profession in detail, and you must try to guess what job it is. Ready? Let’s play! Alright, so this person’s job is quite thankless. Thank the Lord they have decent benefits because their pay will never reflect the amount of work they put in. They are in the trenches daily with the students, working mostly with SPED or ELL kiddoes. You will see them many times in the hallway, and you might smile at them, but their names are likely unknown. If no needy students are available, you might see them helping with bulletin boards or a cutting activity. They love on kids as best they can, and they make a load of difference. Our lives would be a lot muddier without them, and schools would not be able to survive without their help. Any guesses? I hope this was an easy one for you. 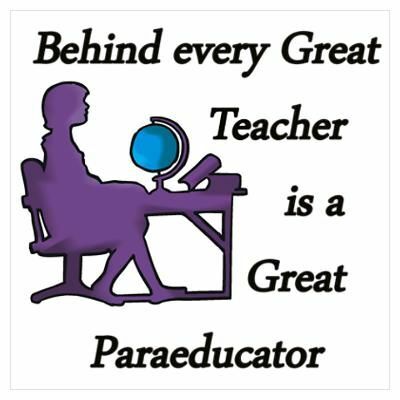 If you said a paraprofessional, you are absolutely correct! (Whoops, I guess the blog title and picture might have tipped you off.) Tell them what they won, Clint! Well, they have won the privilege of reading the rest of this blog. And there was much rejoicing. While thinking about topics for this week, I realized I had never written about paras in the three years this blog has been in existence. This blog is LONG overdue. As I write it, it makes me wonder what God would want to tell us about paras. So, wadda ya say? Let’s go ahead and dive into it. Here are five keys to building effective relationships with paras. Get to know your paras. Connect with them. Go beyond just the name. Where are they from? How many kids do they have? What interests and inspires them? This will help you build connections, which will in turn strengthen relationships. If I were a para and a teacher took a genuine interest in me, that would make me more likely to give my full efforts. It shows you care. It shows they matter. It has the possibility of providing you a healthy friendship. According to Psalm 139: 14, we are ALL beautifully and wonderfully made. Communicate effectively with your paras. This is one I take for granted. For some weird reason, I think the para is always on the same page as me. I expect them to be doing something that I have never communicated about. Talk to them! If you want them to keep an eye on a particular kid, tell them. The same thing goes for expectations with students outside the room when paras take them to catch up or to test in a quiet location. And don’t forget the most important communication of all: greeting them warmly! Make them feel at home the moment they arrive. Sadly, there are days I forget to do that. Encourage your paras. Ever had someone tell you job well done? How’d that feel to you? “Therefore encourage one another and build one another up, just as you are doing” (1 Thessalonians 5: 11). We all need a pep talk now and then. Be the Vince Lombardi they need! Inspire them to show the awesomeness that God put inside them. Praise them in front of the class. Something like, “Hey, can we all just take a second to thank Mrs. So and So for helping out today. There is no way we’d survive without her.” I have found that those comments mean everything to them. “Gracious words are a honeycomb, sweet to the soul and healing to the bones” (Proverbs 16: 24). Amen! Guide your paras in their strengths. We’re all different. According to Ephesians 2: 10, we are unique masterpieces of God’s creation. Dive deeper into 1 Corinthians 12, and you will see we all have different spiritual gifts. Maybe your para has a loving personality. Some are data driven. Others might excel at being empathetic. Encourage them in their strengths, but go the extra mile to tip them off on how to exemplify their strengths. And when you see that para doing exactly what they were instructed, encourage them some more! They can each bring something to the table not offered before. Let paras be a part of your classroom. Ever heard the military credo of never leaving a man behind? Don’t leave a para behind! I allow paras into my class discussions, and I probably should more often than I do already. Sometimes they enjoy sharing with the kids on Mondays about their weekends. There have been blessed moments when they chime in to make an amazing point I had not thought of before. When a para becomes a part of your classroom atmosphere, the kids see that. If they are ever absent, kids notice! Students come to expect that helping hand to be there. My hopes are that this blog reaches many paras out there. As a matter of fact, I am going to send the link to all of my paras to let them know that we’re thinking and praying for them. My wish would be that a few respond back to let us know anything I may have missed above. As a matter of fact, I hope to interview my paras this week and respond back myself with what they had to offer. I likewise want to give some specific shoutouts to them, not to mention a few paras from the past, to give them the credit they deserve. All that being said, evaluate where you are with your paras. We can all improve relationships with them, and never underestimate the importance of praying for them. Paras want to be recognized. They don’t want to be seen as a second class citizen. They want to be a part of something special in your classroom. They want to make a difference. Model Christ to them, guide them, pray for them, and watch God take over. I promise you, your classroom will be a more productive place. Challenge: Thank a para this week! There are so many ways to say thanks. A hand-written note. A buck to snag a soda to get over that mid-afternoon slump. A breakfast sandwich from McDonald’s. Even just saying to your class, “Hey, everyone, I think it is time we show appreciation for our para in the room. How about a round of applause!” Whatever you choose to do, do it with a servant’s heart, not expecting anything in return. Song to bring it home: Steven Curtis Chapman has a song called “Do Everything.” It’s theme is creative and powerful: God can use anyone! It doesn’t matter what job you have, whether you’re a stay at home mom, blue collar construction worker, or white collar Wall Street banker. So long as you are doing everything for the Lord, you can’t go wrong! Prayer: Lord, I pray for the paras that are in the trenches with me. May I guide them through Your principles, and may they touch the hearts of students in a positive way. Amen.